First a tip from a contact – check out the Facebook page www.facebook.com/SpokaneNews where the news is created by the readers of that page. Data comes from the State’s ESD web site. For Spokane, unemployment estimate rose from 7.7% to 8.6%. For the State, unemployment rose from 7.3% to 7.7%. In King County, unemployment went down from 6.3% to 6.1%. Use caution when reviewing the following chart. The original, raw data from the U.S. Bureau of Labor Statistics will not be released to the public for another month or two. Our forecast for January 2013 non-farm employed is a level of 202,200 and an unemployment rate of 8.7% to 8.9%. That’s based on the average cyclical drop from December to January that took place from 2008 through 2012. Compare the monthly totals reading across the chart from left to right. Spokane area unemployment usually peaks in January or February. Spokane’s job creation rate remains at or below the growth of the overall area population, unfortunately. This is a really long and tough downturn. The intent of this web site has been to collect local economic data and historical trends. Some times we stumble on non-economic data we would rather not see and wish we had nothing to do with it. I wish the following finding is not true as this looks really bad. I am not a reporter – and hopefully the linked sources are all wrong. But it would be great if a real reporter would look into this. Last year, the PFD said the Arena needed to be expanded to meet a new NCAA requirement of 12,000 “sellable” seats. The Arena already had 12,000 seats but many hundreds of seats are used by media, bands, cheer teams, official and others such that the Arena had less than 12,000 “sellable” seats. But in June 2012, the NCAA lowered the minimum seat requirements to 10,000. When the Spokane Arena previously held the NCAA Division 1 Men’s Basketball rounds one and two, they failed to fill all available seats (this is before the expansion). The Arena expansion is no longer needed and the PFD is covering this up. The US government’s Bureau of Labor Statistics “raw” data for Spokane County (through November) shows a subdued seasonal rise in jobs. 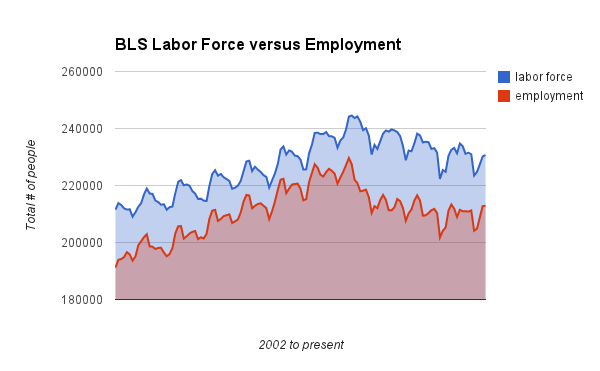 (Data is from the US BLS “One Screen” database). In a traditional post recession recovery, we should be seeing a job growth rate similar to how it was before the recession took hold (pre-2008).